Packaged like a picture book but formatted like an early reader, the vignettes of Giraffe and Elephant's adventures is reminiscent of classic George and Martha books. 2.75 starsI wish I could say I liked this book...but it was weird...and confusing and odd...but oh well.. This book required the reader to do a lot of inferring. Too hard for young children. Love these books! 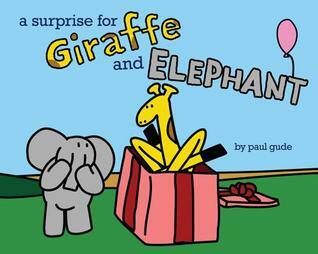 Elephant and Giraffe are unlikely friends who share in humorous short story adventures in their picture books. The Best Time- Giraffe enjoys playing his alpine horn, but must learn when the most appropriate time to play it is.The Toboggan- Elephant gets excited about toboggans so Giraffe works through the night building him one; turns out toboggans are must more fun in climates that get snow.Giraffe's Surprise Party- Elephant asks Giraffe to make a list of what he would like so Elephant can plan a surprise party. Elephant comes through, though his interpretation of Giraffe's list has some humorous results. Highly recommended series for PreK-2. They're funny, simple, and will leave readers eagerly anticipating more! Are picture book short stories a thing now? I thought this would be an entire story, but it's a collection of a few stories about the titular giraffe and elephant. Not a great book for story times unless you read one little vignette at a time. This could be a good early reader, but some of the vocabulary is a little tricky. Overall the stories and humor are nice, and a little clever at times, but not amazing. Move over, George and Martha--make room for Giraffe and Elephant! Gude's simple, expressive drawings and appealingly bright palette combine with his gentle, offbeat sense of humor to produce a winning picture book for all ages. Fans of Mo Willems' Elephant and Piggie will be pleased to make the acquaintance of another pair of friends who know that relationships take work and devotion to move past miscommunication and disappointment. What a dumb book.Separated into 3 "stories" - the first were boring.The third (birthday party) story had a little humor that I appreciated.I like kids books to have a message, if only a subtle message, but I got nothing from this book.Overall, this book is a no. I didn't really enjoy the pictures either.We won't be checking this one out from the library again, nor will we be buying it. I enjoyed the alpine horn story. I had the feeling I was reading a Mo Willems book. What, a Tobogan - no snow in the pictures! Now, oh it is a chapter book for the beginning reader? What and Why! It really had such potential! I cracked up at the first story--was not expecting a plot line involving an alpine horn. Second and third stories were okay. I wonder how much of the slightly sarcastic humor a child would pick up on. Three fun stories featuring two unlikely friends. Odd, but kind of cute. Definitely not one I would use at Storytime though. This is a solid offering for early readers or to use in story time. It does a great job utilizing pictures to explain the story beyond the story. I think the absurdity of this book would be a better fit for adults than children, but I really enjoyed it! Simple story and simple text work for little ones. So bizarre and so hilarious. Tami and I were cracking up. The last story has a wonderful Amelia Bedelia feel to it, very sweet! Witty ending. Great readaloud for surprises and parties theme. Great easy reader--- does include some tougher words "alphine" but they are repeated and illustrated. If you like Piggie and Elephant books, you'll like this one! The author had me at an alpine horn-playing giraffe. More please! I found this story to be disjointed and confusing. When I finished my first thought was "huh?" and I still have no idea what really happened. I liked the art and the "No" cake, but I didn't really like the whole story. Cute illustrations, didn't like it as much as the first one.